Here’s another comprehensive and helpful timeline of Iranian history, found here from BBC World. For the purpose of this blog this post starts with the Islamic Revolution, but the page provides an excellent overview of Iran’s history reaching back to ancient times. 1941 – The Shah’s pro-Axis allegiance in World War II leads to the Anglo-Russian occupation of Iran and the deposition of the Shah in favour of his son, Mohammad Reza Pahlavi. 1950 – Ali Razmara becomes prime minister and is assassinated less than nine months later. He is succeeded by the nationalist, Mohammad Mossadeq. 1951 April – Parliament votes to nationalise the oil industry, which is dominated by the British-owned Anglo-Iranian Oil Company. Britain imposes an embargo and a blockade, halting oil exports and hitting the economy. A power struggle between the Shah and Mossadeq ensues and the Shah flees the country in August 1953. 1953 August – Mossadeq is overthrown in a coup engineered by the British and American intelligence services. General Fazlollah Zahedi is proclaimed as prime minister and the Shah returns. 1963 January – The Shah embarks on a campaign to modernise and westernise the country. He launches the ‘White Revolution’, a programme of land reform and social and economic modernisation. During the late 1960’s the Shah became increasingly dependent on the secret police (SAVAK) in controlling those opposition movements critical of his reforms. 1978 September – The Shah’s policies alienate the clergy and his authoritarian rule leads to riots, strikes and mass demonstrations. Martial law is imposed. 1979 January – As the political situation deteriorates, the Shah and his family are forced into exile. 1979 November – Islamic militants take 52 Americans hostage inside the US embassy in Tehran. They demand the extradition of the Shah, in the US at the time for medical treatment, to face trial in Iran. 1979 1 February – The Islamic fundamentalist, Ayatollah Ruhollah Khomeini, returns to Iran following 14 years of exile in Iraq and France for opposing the regime. 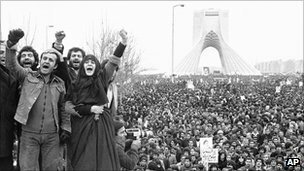 1979 1 April – The Islamic Republic of Iran is proclaimed following a referendum. 1980 January – Abolhasan Bani-Sadr is elected the first President of the Islamic Republic. His government begins work on a major nationalization programme. 1980 July – The exiled Shah dies of cancer in Egypt. 1980 22 September – Start of Iran-Iraq war which lasts for eight years. 1981 January – The American hostages are released ending 444 days in captivity. 1981 June – Bani-Sadr is dismissed, he later flees to France. 1985 – After the US and Soviet Union halted arms supplies, the US attempted to win the release of hostages in Lebanon by offering secret arms deals, this would later become known as the Iran-Contra affair. 1988 July – 290 passengers and the crew of an Iran Air Airbus are mistakenly shot down by the USS Vincennes. 1988 July – Iran accepts a ceasefire agreement with Iraq following negotiations in Geneva under the aegis of the UN. 1989 February – Ayatollah Khomeini issues a religious edict (fatwa) ordering Muslims to kill British author, Salman Rushdie, for his novel, ‘The Satanic Verses’, considered blasphemous to Islam. 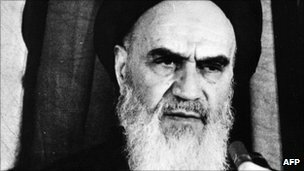 1989 3 June – Ayatollah Khomeini dies. On 4 June, President Khamene’i is appointed as new supreme leader. 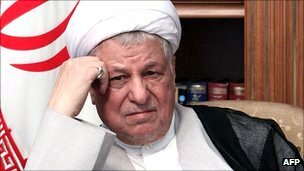 1989 August – Ali Akbar Hashemi-Rafsanjani is sworn in as the new president. 1989 November – The US releases 567 million dollars of frozen Iranian assets. 1990 June – A major earthquake strikes Iran, killing approximately 40,000 people. 1990 – Iran remains neutral following Iraq’s invasion of Kuwait. 1990 September – Iran and Iraq resume diplomatic ties. 1995 – US imposes oil and trade sanctions over Iran’s alleged sponsorship of “terrorism”, seeking to acquire nuclear arms and hostility to the Middle East process. Iran denies the charges. 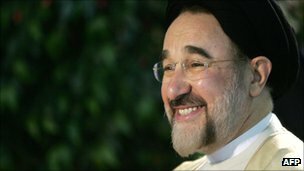 1997 May – Mohammad Khatami wins the presidential election with 70% of the vote, beating the conservative ruling elite. 1998 September – Iran deploys thousands of troops on its border with Afghanistan after the Taleban admits killing eight Iranian diplomats and a journalist in Mazar-e Sharif. 1999 July – Pro-democracy students at Tehran University demonstrate following the closure of the reformist newspaper ‘Salam’. Clashes with security forces lead to six days of rioting and the arrest of more than 1,000 students. 2000 February – Majlis elections. Liberals and supporters of Khatami wrest control of parliament from conservatives for the first time. 2000 April – The judiciary, following the adoption of a new press law, bans the publication of 16 reformist newspapers. 2000 May – Inauguration of the Sixth parliament. 2001 June – President Khatami re-elected. 2002 January – US President George Bush describes Iraq, Iran and North Korea as an “axis of evil”, warning of the proliferation of long-range missiles being developed in these countries. The speech causes outrage in Iran and is condemned by reformists and conservatives alike. 2002 September – Russian technicians begin construction of Iran’s first nuclear reactor at Bushehr despite strong objections from US. 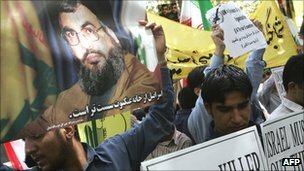 2003 June – Thousands attend student-led protests in Tehran against clerical establishment. 2003 September – UN nuclear watchdog, IAEA, gives Tehran weeks to prove it is not pursuing an atomic weapons programme. 2003 October – Shirin Ebadi becomes Iran’s first Nobel Peace Prize winner; lawyer and human rights campaigner became Iran’s first female judge in 1975 but was forced to resign after 1979 revolution. 2003 November – Iran says it is suspending its uranium enrichment programme and will allow tougher UN inspections of its nuclear facilities. IAEA concludes there is no evidence of a weapons programme. 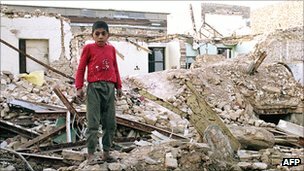 2003 December – 40,000 people are killed in an earthquake in south-east Iran; the city of Bam is devastated. 2004 February – Conservatives regain control of parliament in elections. Thousands of reformist candidates were disqualified by the hardline Council of Guardians before the polls. 2005 August-September – Tehran says it has resumed uranium conversion at its Isfahan plant and insists the programme is for peaceful purposes. IAEA finds Iran in violation of the nuclear Non-Proliferation Treaty. 2004 June – Iran is rebuked by the IAEA for failing to fully cooperate with an inquiry into its nuclear activities. 2004 November – Iran agrees to suspend most of its uranium enrichment under a deal with the EU. 2005 June – Mahmoud Ahmadinejad, Tehran’s ultra-conservative mayor, wins a run-off vote in presidential elections, defeating cleric and former president Akbar Hashemi Rafsanjani. 2006 January – Iran breaks IAEA seals at its Natanz nuclear research facility. Bomb attacks in the southern city of Ahvaz – the scene of sporadic unrest in recent months – kill eight people and injure more than 40. 2006 February – IAEA votes to report Iran to the UN Security Council over its nuclear activities. 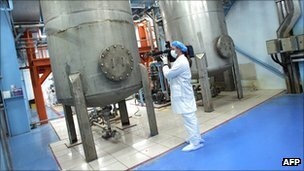 Iran resumes uranium enrichment at Natanz. 2006 April – Iran says it has succeeded in enriching uranium at its Natanz facility. 2006 31 August – UN Security Council deadline for Iran to halt its work on nuclear fuel passes. IAEA says Tehran has failed to suspend the programme. 2006 December – Iran hosts a controversial conference on the Holocaust; delegates include Holocaust deniers. UN Security Council votes to impose sanctions on Iran’s trade in sensitive nuclear materials and technology. Iran condemns the resolution and vows to speed up uranium enrichment work. 2007 February – IAEA says Iran failed to meet a deadline to suspend uranium enrichment, exposing Tehran to possible new sanctions. 2007 March – Diplomatic stand-off with Britain after Iran detains 15 British sailors and marines patrolling the mouth of the Shatt al-Arab waterway separating Iran and Iraq. 2007 April – President Ahmadinejad says Iran can produce nuclear fuel on an industrial scale. 2007 May – IAEA says Iran could develop a nuclear weapon in three to eight years if it so chooses. 2007 June – Protests erupt after government imposes petrol rationing amid fears of possible UN sanctions. 2007 July – Iran announces plans to stop making cars that only run on petrol and switch to dual-fuel vehicles, which also run on gas. 2007 October – US announces sweeping new sanctions against Iran, the toughest since it first imposed sanctions almost 30 years ago. 2007 December – A new US intelligence report plays down the perceived nuclear threat posed by Iran. 2008 February – Iran launches a research rocket to inaugurate a newly built space centre. Washington describes the launch as “unfortunate”. 2008 March – President Ahmadinejad makes unprecedented official visit to Iraq, where he calls on foreign troops to leave. He also stresses his government’s desire to help rebuild Iraq and signs a number of cooperation agreements. Conservatives win over two-thirds of seats in parliamentary elections in which many pro-reform candidates were disbarred from standing. The conservatives include supporters of President Ahmadinejad as well as more pragmatic conservatives who oppose his confrontational foreign policy. 2008 May – IAEA says Iran is still withholding information on its nuclear programme. Iran’s new parliament elects former nuclear negotiator Ali Larijani as its speaker. 2008 June – EU foreign policy chief Javier Solana presents an offer of trade benefits, which Tehran says it will look at, but will reject if it demands suspension of uranium enrichment. 2008 July – Iran test-fires a new version of the Shahab-3, a long-range missile it says is capable of hitting targets in Israel. 2008 August – Informal deadline set by Western officials for Iran to respond to package of incentives in return for halt in nuclear activities passes without reply. 2008 September – UN Security Council passes unanimously a new resolution reaffirming demands that Iran stop enriching uranium, but imposes no new sanctions. The text was agreed after Russia said it would not support further sanctions. 2008 November – Parliament votes to dismiss the interior minister, Ali Kordan, who admitted that a degree he said he held from Oxford University was fake. The move is a blow to President Ahmadinejad ahead of next year’s presidential election. In an unprecedented move, President Ahmadinejad congratulates US president-elect Barack Obama on his election win. Mr Obama has offered to open unconditional dialogue with Iran about its nuclear programme. 2008 December – Police raid and close the office of a human rights group led by the Nobel Peace Prize winner, Shirin Ebadi. Officials say the centre is acting as an illegal political organization. 2009 February – Speaking on the 30th anniversary of the Islamic revolution in Iran, President Mahmoud Ahmadinejad says he would welcome talks with the US as long as they are based on “mutual respect”. 2009 March – Supreme Leader Ali Khamenei tells anti-Israel rally that US President Obama is following the “same misguided track” in Middle East as President Bush. 2009 April – An Iranian court finds Iranian-American journalist Roxana Saberi guilty of spying for the US. She is sentenced to eight years in prison. 2009 May – Iran rejects a US state department report saying it remains the “most active state sponsor of terrorism” in the world. Jailed Iranian-American journalist Roxana Saberi is freed and returns to US. 2009 June – Mahmoud Ahmadinejad is declared to have won a resounding victory in the 12 June presidential election. The rival candidates challenge the result, alleging vote-rigging. Their supporters take to the streets, and at least 30 people are killed and more than 1,000 arrested in the wave of protests that follow. The Iranian authorities claim foreign interference is stoking the unrest, and single out Britain for criticism. 2009 July – President Ahmadinejad dismisses his most senior vice-president, Esfandiar Rahim Mashaie, under pressure to do so by Supreme Leader Ayatollah Ali Khamenei. 2009 August – Mahmoud Ahmadinejad sworn in for second term as president, presents cabinet – the first since the founding of the Islamic Republic in 1979 to include women. A number of senior opposition figures are accused of conspiring with foreign powers to organise unrest and are put on trial. Supreme Leader Ayatollah Ali Khamenei says there is no proof that opposition leaders blamed for the post-election unrest were agents of foreign powers. 2009 September – Iran admits that it is building a uranium enrichment plant near Qom, but insists it is for peaceful purposes. The country test-fires a series of medium- and longer-range missiles that put Israel and US bases in the Gulf within potential striking range. 2009 October – Five permanent UN Security Council members plus Germany offer Iran proposal to enrich its uranium abroad. 2009 November – Iran refuses to accept the international proposal to end the dispute over its nuclear programme. UN nuclear watchdog IAEA passes a resolution condemning Iran for developing a second uranium enrichment site in secret. Iran denounces the move as “political” and announces plans to create 10 more uranium enrichment facilities. 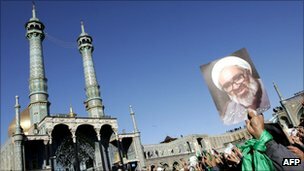 2009 December – Death of influential dissident cleric Grand Ayatollah Hoseyn Ali Montazeri triggers further clashes between opposition supporters and security forces. At least 8 people die in what is the worst violence since the contested presidential election. 2010 January – Iran executes two men arrested during the period of unrest that followed the disputed presidential election of June 2009. It also puts 16 people on trial over the Ashura Day opposition protests in December, when eight people were killed. Iranian physics professor Masoud Ali-Mohammadi is killed in a bomb attack in Tehran. No group claims responsibility. The government accuses the US and Israel of his death, while Iranian opposition groups say Mr Mohammadi supported one of their candidates in last year’s presidential election. 2010 February – Iran says it is ready to send enriched uranium abroad for further enrichment under a deal agreed with the West. The US calls on Tehran to match its words with actions. Opposition leader Mir Hossein Mousavi says the opposition will continue its peaceful struggle against the government. 2010 May – Iran reaches a deal to send uranium abroad for enrichment after mediation talks with Turkey and Brazil; Western states respond with scepticism, saying the agreement will not stop Iran from continuing to enrich uranium. 2010 June – UN Security Council imposes fourth round of sanctions against Iran over its nuclear programme, including tighter financial curbs and an expanded arms embargo. 2010 July – International outcry as a woman is sentenced to death by stoning for adultery. 27 killed as suicide bombers attack a Shia mosque in Zahedan near the Pakistan border. 2010 August – In what Tehran describes as a milestone in its drive to produce nuclear energy, engineers begin loading fuel into the Bushehr nuclear power plant. 2010 September – Stuxnet – a computer worm which affects industrial systems and which may have been created by a nation-state – is reportedly detected in staff computers at the Bushehr nuclear plant. Sarah Shourd, a US citizen caught hiking with two friends near the Iran-Iraq border, is freed after a year in prison. The three deny they were spying. US imposes unprecedented sanctions against eight senior Iranian officials for human rights violations. 2010 October – A former British embassy employee jailed in 2009 for espionage has his sentence commuted. 2010 December – Main achievement of talks in Geneva between Iran and key world powers on Iran’s nuclear programme is to agree to hold another round of talks in Istanbul in January. President Ahmadinejad sacks Foreign Minister Manouchehr Mottaki, thought to be his main opponent within Iranian leadership. 2011 January – Nuclear chief Ali Akbar Salehi says Iran now possesses technology needed to make fuel plates and rods for nuclear reactors. 2011 February – First mass opposition demonstrations in a year amid a wave of unrest rippling across the Middle East and North Africa. Iran sends two warships through Suez Canal for first time since the Islamic Revolution, in what Israel describes as an act of provocation. 2011 April – Rare public row between Supreme leader Ayatollah Khamenei and President Ahmadinejad over the resignation of Intelligence Minister Heidar Moslehi. 2011 May – Iran’s Atomic Energy Organisation says the generating unit at the Bushehr nuclear power plant has begun operating at a low level. 2011 August – Two US citizens arrested on the Iran-Iraq border in 2009 are found guilty of spying and sentenced to eight years in prison. 2011 September – Iran announces that the Bushehr nuclear power station has been connected to the national grid. 2011 October – The US accuses Iran of being behind an alleged plot to kill the Saudi ambassador to Washington. Tehran rejects the charges as part of an American propaganda campaign. 2011 November – A report by the UN nuclear watchdog, the IAEA says Iran is carrying out research that can only be used to develop a nuclear bomb trigger. Iran rejects the findings as politically motivated. 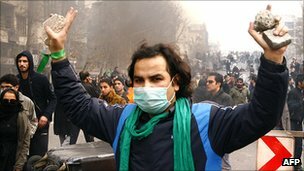 2011 November/December – The British embassy in Tehran comes under attack from protesters after London imposes tighter economic sanctions. Britain evacuates its diplomatic staff from Iran and expels all Iranian diplomats, but the two countries do not sever all ties.